Compared to other metals in the 440 family (ie. 440B and 440C), 440A has a slightly lower carbon content which makes it slightly softer. That means it can be sharpened easily and machined handily. 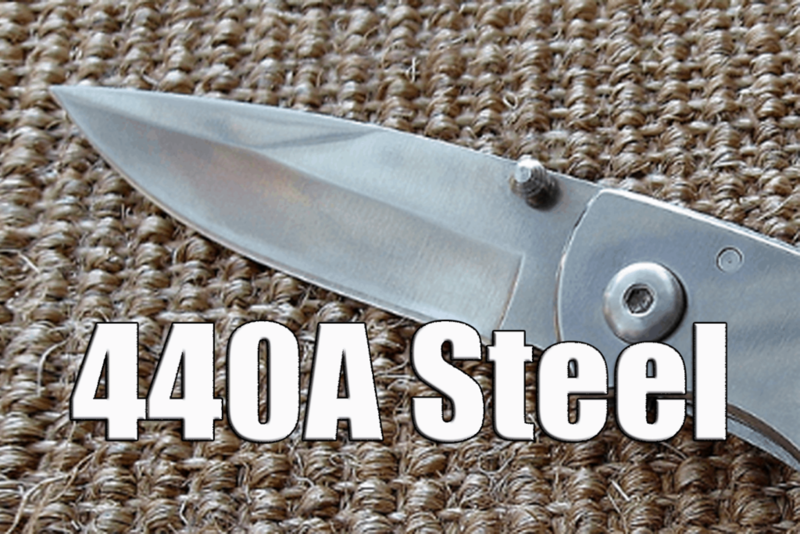 Compared to other kinds of stainless steels, 440A is one of the most common for inexpensive knife blades as it is relatively cheap compared to higher quality steels. Many display only and replica weapons are made with 440A for this reason. Having said this, there are many higher-end knives that use 440A since it can be heated to a very high temperature to achieve higher hardness values. There are 440A knives that are priced lower, but that is due in part to the quality of the other parts of the knife (handle, fasteners, etc.) and name brand power. So, in some cases, price and stain resistance are the high points of this metal. Besides being used for display knives and swords, it is also a preferred choice for diving knives. Salt water has little corrosive effect on it. The PUMA Master Pocket Folding Knife is a German knife made of 440A Steel. It’s not exactly a low-end cheap knife! I would love to own this knife! While good in terms of cost and stain resistance, 440A steel is not so stellar in wear resistance. Replica weapons don’t need to withstand use or force, so that is why it is a natural choice for those items. 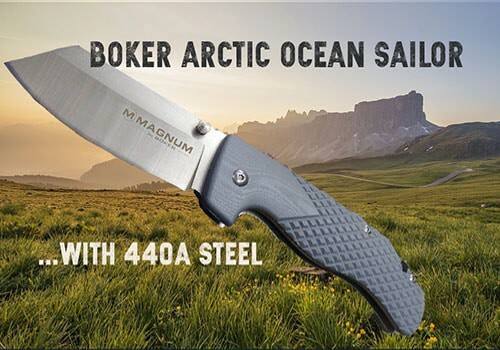 I would not use a 440A steel knife for prying anything significant, and of course, you should probably not use ANY folding knife for prying at all since that will compromise the fulcrum or folding point of even the best knives. That being said, 440A steel is said to have enough wear resistance for mild day-to-day use in camping, outdoor and kitchen use. (Read our guide to butterfly knives). You wouldn’t want to construct a survival knife or surgical scalpel out of it. Yet it does well in areas where rust resistance is the primary concern as mentioned regarding diving knives. Diving knives aren’t in continuous use, so the wear resistance isn’t an issue. However, those kinds of knives do need to be rust free under adverse conditions. To anneal (heat and then let cool slowly) 440A, heat it to 850-900°C, and slowly cool it to about 600°C in the furnace. After that, air cool. Hardening is done at 1010-1065°C; quenching should be done in air or warmed oil. Right after hardening, it should be tempered at 150-370°C. Lower temperature in tempering yields a harder end product. If you temper above 370°C, the impact resistance of the blade will be compromised. However, tempering in the range of 590-675°C gives a boost to the impact resistance. The offset is that you lose hardness. The Gerber Steadfast fixed blade knife is a classic re-design from the earlier years of Gerber. The clip point blade features bead-blasted 440A stainless steel and a plain edge. A textured SoftGrip overmold on a hard substrate makes the handle, along with deep finger grooves. It has a small pommel, and it also comes with a nylon sheath which features a protective liner. The Boker Arctic Ocean Sailor is a tough EDC folding knife with a hefty, chunky and dependable design. It sports an arctic gray G10 handle and a satin finished modified clip point blade. Two ambidextrous thumb studs give you a easy way to open the blade with one hand (also looks cool when you can do that). The textured G-10 scales are backed up by a stainless steel liner lock for excellent safety. There’s also a deep carry pocket clip for secure carry. In short, 440A steel makes a good choice for applications where cost and stain resistance are foremost. If the ability to hold an edge or toughness is a bigger concern, choose another metal. If used as a display item or a light-duty tool, then it will serve well. 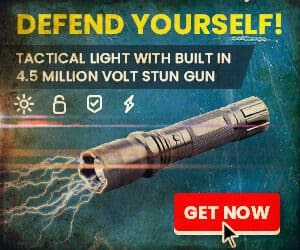 Overall, 440A will serve well in a whole lot of conditions and situations that all but the most hard-core survivalists will encounter. Many knives with 440A steel fall in the sub-one hundred dollar range and many good knives will come in under $50. Please note that I’m not saying 44aA is junk. What I am saying is that both 440 and Aus-8 are curiously found in nearly every knife on the lower end of the price spectrum. There’s a reason for this. If you are a steel/knife fanatic who knows everything possible about every steel or knife ever made, please understand that my conclusions are meant to be concise, short and very generalized, non-exhaustive comments that are easy to understand for someone new to knives and steel. This article is not meant to be an in-depth, metallurgical and technical essay on every aspect that is academically possible to cover regarding this steel. Above all please note that my conclusions represent my opinions after hours of research and some experience with the steel. 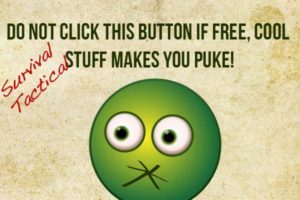 After all, that is really what anyone’s reviews are on any product on any website, right? 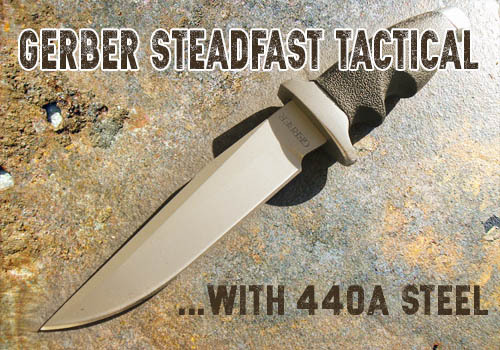 440A Stainless Steel is something I’d classify as a ‘sportsman and general use’ blade steel.It is soft and takes a sweet edge.As you already mentioned Josh it is highly rust resistant.I have no problem with Gerber’s 7Cr17MoV (440A equivalent) because it performs within the properties of 440A. 440A was widely used under many American knife manufacturers like Western Cutlery,Schrade’s USA(Uncle Henry line and a little bit on Old Timer),Imperial,Camillus,and Gerber’s USA years (late 80’s to about the year 2000 then changed to 420HC).These companies used 440A because they expected the user would be cleaning game or fish with it and enjoying the high sharpness.Doing yard work,carving food sticks for the campfire,doing crafts,cutting open a blister pack,stripping wire,cutting a piece of rope or twine now and then…you name it.That’s an essential blade steel and 440A lasts. But 440A does get labeled as junk by people who buy a $25 Gerber as a full-time box cutter.They find out they have to touch it up often and don’t get what the steel was intended for or why people buy it. I’m not a steel expert by any stretch, I just like what works. I bought a very inexpensive fixed blade knife with the idea that it would be ruined during winter use ($19 ). I live in Alaska and it’s not uncommon to wear a knife out due to hard use. The steel of this knife has been really impressive. The knife holds and edge and is easy to sharpen. I don’t know what “mild” duty for a knife is, but I’ve used this thing to cut leaded line, baton countless pieces of firewood (it’s how I heat my house), chop ice that gets on everything, cut countless amounts of line in saltwater, and even clean fish. It’s held up just fine. So I don’t know if 440a is a good knife steel or not. I do know that my 440a knife has done everything I’ve needed it to do and is still going strong. Excellent to hear Stuart! 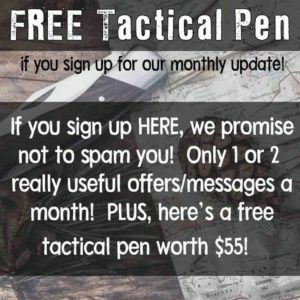 I appreciate you checking out our site and offering your insight from experience! To sharpen my knives I use the Ken Onion work sharp with blade grinding attachment. Most of my knives use 440A and I have shaved my face a few times with them (I just wanted to make sure I did a good job with sharpening). Most of mine are MTech with Matince Corps logos on them. Eventually I’ll upgrade knife steel to more high carbon steel so they’ll hold edge longer and they’ll be stronger overall. Semper fi. I have a Marto Brewer Explora made of 440 stainless. 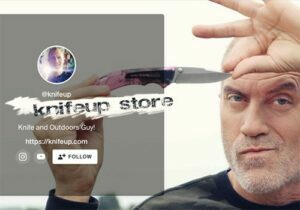 It’s a very collectable survival knife. But I digress. This knife was made in the early 80’s. Is 440 the same as 440A? Thanks for the question! As far as we can tell, 440 is a category of steels where each steel in that category has a letter rating like 440A or 440C. 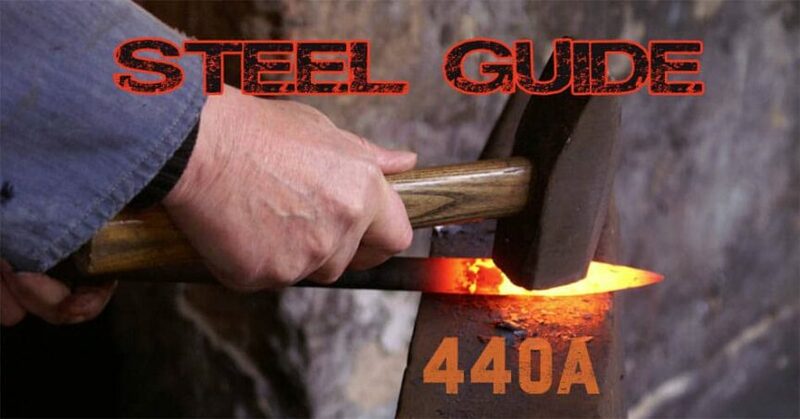 Each steel with a letter like A, B or C has specific qualities different than the others, but they’re close enough to be under the bigger category of 440. So, the answer to your question is “not necessarily”. I’m sure that’s clear as mud, but it’s the best I’ve got at midnight! Robert, what do you call “better?” The article above states that 440A is durable, sharpens easily, is able to be tempered to a range of hardness, is highly corrosion resistant, and is inexpensive. All of these are good qualities and would seem a sensible choice for a knife developed for a military customer. Is a ball peen hammer “better” than a claw hammer? Is a corvette “better” than a dune buggy? WHY THEN DOES THE EICKHORN CO. USE 440A STEEL IN THEIR UK2000 LIGHTWEIGHT COMBAT UTILITY KNIFE? YOU WOULD THINK THAT EICKHORN WOULD USE A BETTER STAINLESS STEEL FOR A COMBAT KNIFE, REGARDLESS OF THE WEIGHT.